Mr. John Guisebertus Hoetmer and Miss Anna Pauline Timmerman were married in Holland in 1906, shortly before joining a group of twenty people immigrating to America. (Holland is a western province of what is now the Netherlands.) 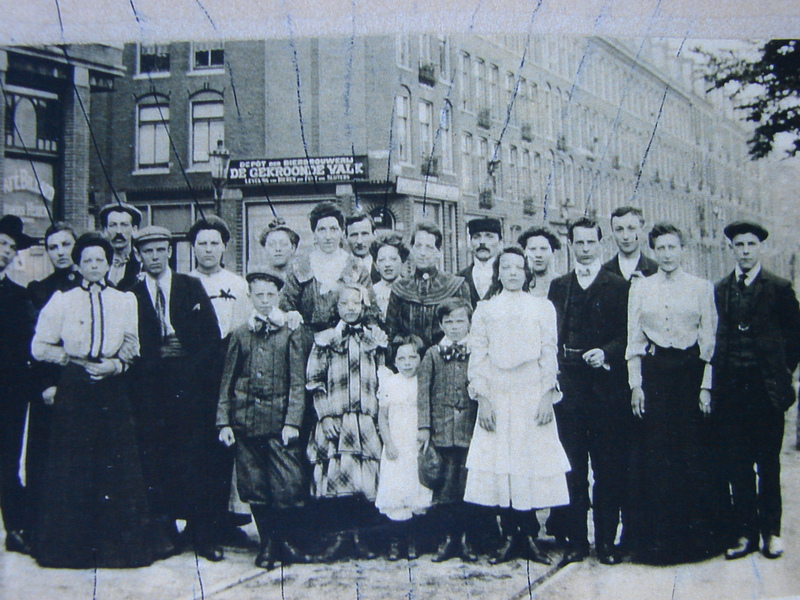 Most of the people in the 1906 immigrant group were related to one another through the Timmerman and Lobberegt (pronounced Lob-er-ette) families. The families determined to leave their native land to save their sons from forced conscription into the military. Family patriarch “Uncle Joe” Lobberegt preceded the group to America and agreed to sponsor them for immigration. He had to promise the U.S. government that he would feed the group and see that they learned to speak English. The Dutch immigrant group was photographed in Amsterdam in 1906 before their departure for Seattle. Phot used by permission; do not copy. Seattle was the Chosen Land of this Dutch exodus. Most of the group settled between NE 75th to 80th Streets, on either side of 35th Ave NE in what is now called the Wedgwood neighborhood. In the 1920s, before the neighborhood had an official designation, the large number of Dutch settlers caused the area around NE 77th Street to be nicknamed Little Holland or Dutch Hollow. Several of the houses which the Dutch immigrants built in Wedgwood are still standing. Ryk Spoor married one of the Lobberegt’s daughters and built a house which still stands at 7714 37th Ave NE. In 1955 the VanderWel house was moved from the present parking lot of Chase Bank, to 7308 38th Ave NE. 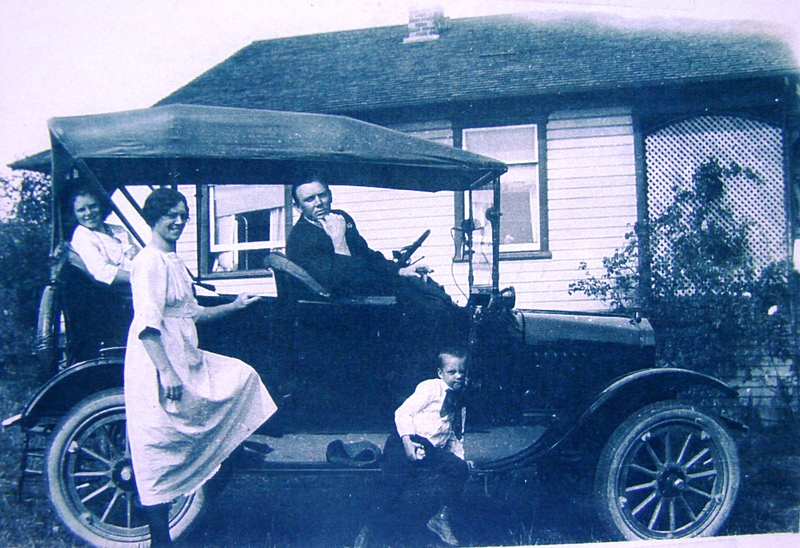 The VanderWel family built a house at what is now the parking lot of the Wedgwood branch of Chase Bank, on 35th Ave NE just north of the intersection of NE 75th Street. The house was later moved for business development of the McGillivray’s store, and the VanderWel house is now located at 7308 38th Ave NE. John Hoetmer and his bride, Anna, built their house at 7336 34th Ave NE. Daughter Bertha, born in 1907, and son John Jr., born 1913, attended Ravenna Elementary School (which went through eighth grade in those days) and Roosevelt High School. The children were proud to be first-generation Americans. Their father John Sr. prospered in his work as an auto mechanic, and by the 1920s he was the proud owner of two service stations. In 1919 six-year-old Johnny Hoetmer posed with his parents and sister. The Hoetmer family prospered until the Great Depression of the 1930s strained family finances. Photo used by permission of the Hoetmer family. In 1929 the economic prosperity of the 1920s gave way to the economic crash called the Great Depression. By 1931 the economic depression’s effects were being felt across the nation, and many businesses were in trouble. John Hoetmer Sr. owed $900 to U.S. Royal Tire Company for tires he had sold to customers on credit at his gas station, for which the customers had never paid him. Mr. Hoetmer was broke, and was unable to repay the tire company. A bank took title of the Hoetmer family home and loaned them money to repay U.S. Royal. The Hoetmers were allowed to continue to live in their house, but they had to pay rent to the bank until their debts were paid off. John Hoetmer Jr. was sixteen years old and he never forgot the galling experience of the visit of the bank official and the blow to the family’s sense of pride and self-sufficiency. On July 4, 1927, opening day of the Sand Point Country Club and Golf Course, John Jr. began working as a caddy. He was thirteen years old. In 1931 Johnny graduated from high school and he sought more hours of work at the golf course to help with his family’s financial needs. But soon the Sand Point Country Club began to founder under the effects of the Great Depression, and Johnny was laid off. Another golf course, Meadowbrook, opened in 1932, and six months after it opened Johnny got a better job there as assistant to the course’s golf pro. In this 1930s photo of Meadowbrook Golf Course we are standing looking northward to the present site of Nathan Hale High School. Our backs are to the hill where NE 105th Street is at the top. Workmen are shown here trying to improve the drainage of the soggy field by dredging a channel at the base of the hill. The clubhouse for the Meadowbrook Golf Course was located on the northwest corner of the site at 30th Ave NE and NE 110th Street. Photo of 1954 from the King County Tax Assessor. The Meadowbrook Golf Course was located on the present site of Meadowbrook Community Center and Nathan Hale High School, between NE 105th to 110th Streets and 30th to 35th Avenues NE. The land had originally been developed as a farm by a German immigrant, August Fischer, in the 1890s. Swampy, with a branch of Thornton Creek running through it, the land had been put up for sale in the 1920s but was deemed unsuitable for housing development. Meadowbrook Golf Course was built by the Time Oil Company as an investment, leasing the land from the eight Fischer children of August Fischer. Dave Craig was the designer and builder of the nine-hole course. In 1932 Meadowbrook’s golf pro, Harold Neimeier, hired nineteen-year-old John Hoetmer Jr. as an assistant at $10 for a 60-hour week. Some of Johnny’s duties were to build and repair wood-shafted golf clubs, sell greens-fee tickets, and give lessons. In 1933, Niemeier left and Johnny Hoetmer, at age twenty, became general manager at Meadowbrook. The Meadowbrook Community Center at 10517 35th Ave NE opened on January 11, 1997. It faces 35th Ave NE on the former golf course, now Nathan Hale field. As a Depression-era child of the 1930s Al Blindheim, grandson of August Fischer, recalled how Mr. Hoetmer would allow neighborhood kids to do weeding at Meadowbrook in exchange for playing the course. Mr. Hoetmer would give each child a shoebox and when it was full of weeds they were to bring it to him. Al would stealthily drift toward the edge of the greens, where there were more weeds. By so doing, he could fill his box quickly and soon return to play a free round of golf. In 1938 Johnny Hoetmer became president of the Pacific Northwest Professional Golfers Association, and played in a number of tournaments. The loss of an eye that year, struck by a golf ball while playing at Olympic Golf Course, did not diminish John’s love for the game. He met his wife, Alice, while playing golf, and as their two children, Judy and Ron, grew up, they too developed into golfers. The family joke was that naturally, the Hoetmers had to have two children so that they and their parents could make up a golf foursome. Judy was a star member of the golf team during college years at the UW, and Ron, like his dad, made golf his career. Ron became head professional at Overlake Golf & Country Club. The golf course at the Sand Point Country club has views to the northeast out over Lake Washington. After the close of World War Two the Sand Point golf course revived and got going again, and Johnny Hoetmer was lured back there to start as head professional on October 1, 1945. From then until his retirement in 1973, John distinguished himself in teaching and promoting the sport of golf. He organized meets, was active in golf associations and competed in tournaments. He became particularly known for his patient tutoring and for holding up a standard of fine sportsmanship for younger generations to follow. His Dutch heritage of community spirit, mentoring and encouraging others made John an outstanding sportsman and a community treasure. Copyright notice: This article, based upon Valarie’s 1998 interview with Johnny Hoetmer, first appeared in the Jet City Maven, a Lake City neighborhood newspaper, in 1998. Text and photos are protected under a Creative Commons Copyright; do not copy without permission. This entry was posted in Immigrant heritage, Meadowbrook neighborhood and tagged Meadowbrook Golf Course, Neighborhood History, Sand Point Golf Course, Seattle. Bookmark the permalink.